Home of the "1st Year Price Guarantee"
Smart Self Storage is committed to assisting you with all your storage needs while maintaining your budget. That is why we instituted the “1st Year Price Guarantee” at all of our facilities. We guarantee the price of your unit will remain the same for 1-year from the start of your lease with NO increases in your rental rate (excluding initial specials outlined below). We also offer unique specials on specific size units at each facility based on availability throughout the year. Please visit a specific location website, then print a coupon or contact the manager for details about the currently available specials. *Coupons are for new rentals only. See manager for details, some restrictions may apply. *SPACE SIZE: Advertised space sizes are approximate and for comparison purposes only. Spaces may be smaller or larger than advertised. Spaces are not rented by the square foot, and rent is not based on square-foot measurements. All Internet specials are at select locations on select units. Offer applies to new rentals by new customers only at participating Smart Storage locations. One coupon offered per customer. Offer available at selected locations and is subject to availability. 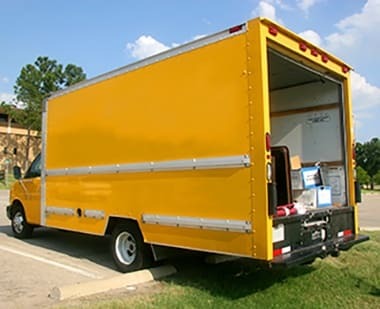 Use of the Move-in Truck is based on availability and terms and restrictions apply. Features and amenities vary by location.